Wasabi peas are a crunchy snack made with dehydrated peas and wasabi seasoning. Of course, this description sounds fairly boring when you consider that wasabi peas are actually both salty, spicy and bursting with bold flavor. In addition to the tastiness factor, wasabi peas have certain nutritional advantages that make them a reasonably healthy snack despite their sodium content. According to the United States Department of Agriculture, a 1-ounce serving (55 pieces) of wasabi peas contains 130 calories and 4 grams of fat, of which 1.5 grams are saturated. That might not sound like much, but if you consume a 2,000-calorie diet, the 1.5 grams of saturated fat is 7 percent of your recommended daily limit of 22 grams. Staying within that saturated fat limit can go a long way toward keeping your heart healthy and reducing your risk of heart disease. A diet low in saturated fat can also help you maintain healthy cholesterol levels and keep your blood pressure within a normal range. You'll get 4 grams of protein in 1 ounce of wasabi peas. That translates to 9 percent of the 46 grams of protein women need as part of their daily diets and 7 percent of the 56 grams men require on a daily basis. Protein foods contain amino acids, which your body uses to make new proteins to support the normal function of your cells, tissues and muscles. That same 1-ounce of wasabi peas also delivers 1 gram of dietary fiber, a nutrient that can help prevent constipation and reduce your risk of certain health conditions such as heart disease and type 2 diabetes. Women need 25 grams of fiber every day while men need 38 grams, according to the Mayo Clinic. Wasabi peas don't provide much in the way of vitamins, but you'll get a decent amount of the mineral iron from them. A 1-ounce serving offers 1.08 milligrams of iron. Iron plays a critical role in the formation of red blood cells, which move oxygen through your body. An iron deficiency can lead to fatigue because your cells aren't getting the oxygen they need to promote the normal function of your body. A 1-ounce serving of wasabi peas also has 85 milligrams of sodium. That's almost 4 percent of the 2,300 milligrams of sodium to which you should limit yourself each day. Adhering to that limit is a healthy way to lower your risk of high blood pressure, heart attack and stroke. 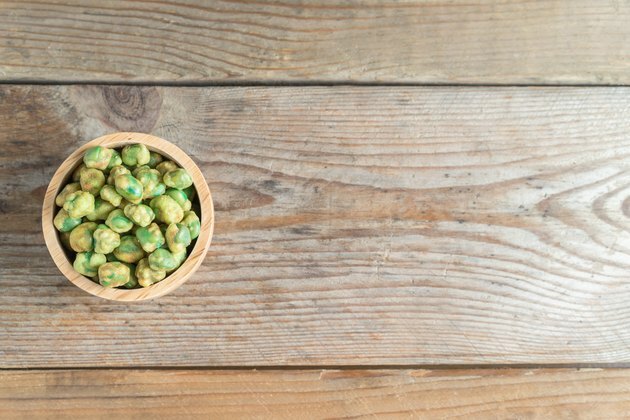 Having a handful of wasabi peas is a tasty way to boost your intake of protein and fiber, but stick to a small serving at a time to keep your sodium and saturated fat intake within healthy limits. Add wasabi peas to nuts to make a trail mix or top your favorite stir-fry recipe with the peas. Crush wasabi peas with whole-wheat bread crumbs to make a bold coating for grilled chicken or fish. Stir wasabi peas into tuna salad, pasta salad or homemade soup to enhance the flavor and add a bit of crunch.